Summer vacations are ending between mid-August and early-September as parents, teachers, and students prepare for a new season – Back-to-School! Teachers are decorating classrooms, arranging flexible seating, writing lesson plans, and organizing supplies. Parents are completing forms, buying school supplies, structuring a schedule, and making lunches. Students are dreading another year (except the seniors), but the reunion amongst friends is sure to turn frowns upside down. Academic years always start out strong and poised for success. How does your school (or workplace) violence prevention measure up? In the last academic year, our neighbors in Florida and Texas each endured one of the deadliest school shootings since Columbine in 1999. 27 fatalities occurred between them, including five employees. From an occupational safety viewpoint, every person, who has business on campus, is an “employee.” Everyone has a job to do – teach, learn, direct, cook, clean, etc. OSHA defines “workplace violence” as any act or threat of physical violence, harassment, intimidation, or other threatening disruptive behavior that occurs at the work site. An effective violence prevention plan must take precedence over your response plan. Management and Worker Commitment – Defining adequate resources and establish a violence prevention culture. Multidisciplinary Team Approach – Involving others with diverse expertise needed for the complexity of preventing workplace violence. Written Policy/Program Tailored to Organization’s Needs – Documenting a precise action plan while incorporating creativity to ensure maximum retention. Training – Teaching others about hazard identification and reporting procedures. 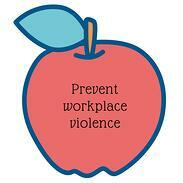 Culture Change – Modifying the workplace culture to include awareness of violence prevention. Evaluation – Measuring the impact of your plan’s efforts (both good and bad). Any place – any time. Workplace violence can occur anywhere. How many times have you heard, “I never imagined it would happen here.” No one wants to believe workplace violence will strike at the heart of their equilibrium, but that does not excuse an ineffective prevention strategy.